‘Life’ is the magic word for decisive currents of modern philosophy. Much of the tone for this debate over the last one and a half centuries has been set by Nietzsche . His early meditation on the ‘Uses and Disadvantages of History for Life’ might be seen as one of its rhetorical starting points. 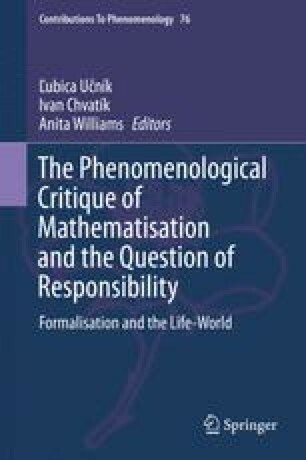 From the very onset until its most recent developments, the reference to the lived experience was also a core issue and main concern of phenomenology. Husserl ’s notion of the ‘life-world ’ (or the Natural World in Patočka ’s words) bears witness to this basic inspiration of phenomenology. The interpretation of the life-world , however, did find its primary setting within the confines of subjectivity . Despite being confident of its validity, Patočka ’s Natural World turns into a document for the dissolution of this subjectivist approach. Subjectivity itself becomes the ultimate explicandum. Descartes, René. 2008 . Discourse on the method of rightly conducting the reason, and seeking truth in the sciences [Discours de la methode]. The Project Gutenberg EBook. http://www.gutenberg.org/files/59/59-h/59-h.htm. Accessed 20 Jan 2014. Descartes, René. 2010–2015. Conversations with Burman. Trans. and ed. Jonathan Bennett. www.earlymoderntexts.com/pdfs/descartes1648.pdf. Nietzsche, Friedrich Wilhelm. 1886. Beyond good and evil: Prelude to a philosophy of the future. The Nietzsche Channel. http://www.thenietzschechannel.com/works-pub/bge/bge1.htm. Accessed 20 Jan 2014.